Gas chainsaw are noisy and they spew fumes. Electric chainsaws are limited by their extension cords and it’s annoying having to manage that cord. Battery powered chainsaws are the future, no doubt about it. A battery chainsaw is untethered, allowing you complete freedom of movement — but more than that, they’re quiet, lightweight and require no maintenance. What else do you want? Before we discuss the 40V DeWalt chainsaw I want to introduce to the new FLEXVOLT 60V DeWalt chainsaw officially released on April 1, 2017. To learn more I recommend you read our comprehensive article on the DeWalt FLEXVOLT system. If you depend on tools to make a living or you’re a serious hobbyist then you’ll really appreciate the technology and innovation behind the FLEXVOLT system, which is also backward compatible with all of DeWalt’s 20V tools. Amazing performance and flexibility with this new DEWALT chainsaw. Before we get into all the details watch this video from Jeff Patterson, who does a great job of showing off what this DEWALT cordless chainsaw can do. And, he has a great youTube channel will lots of great DIY videos, packed with tips and advice for homeowners. Do you have memories of your dad working out in the garden when you were a small child? Maybe he was mowing the grass, cutting branches off the trees, or even chopping logs in half to throw on your fire. No matter what he was doing, it’s likely you thought of it as manly work, and those same thoughts have crept over into your adult life. Sometimes there is nothing more exciting than stepping into the garden and getting sweaty putting in a hard shift, except it would be crazy to think things haven’t changed. Take the power tools you have available today, for example. Or more specifically, the cordless power tools you can order from Amazon and have delivered in one day. If you need to carry out any job in your garden, within reason, you have a technologically-advanced power tool to do it. One of the biggest questions people always ask about them is related to the battery. There are different options out there, so what does Ah actually mean? Before we move onto a few DEWALT cordless chainsaw reviews, I think it would help to answer that exact question. So What Does ‘Ah’ Actually Mean? I know, you don’t want to revisit your adolescent nightmares of electronics class. Don’t worry, we know it’s complicated. We’re just here to give you the basics. Let’s take a look at how it works, so using the simplest explanation possible; imagine you’re standing in front of a 1 Ah battery. If your imaginary DEWALT cordless chainsaw battery used 1.0 amp of current, the battery would be dead in exactly 1 hour. Even though that would only happen under 100 percent ideal conditions, it’s essentially how it works. The DEWALT cordless chainsaws we’re going to look at today have either a 4 Ah or 6 Ah battery. As I’m sure you can probably guess, the 6 Ah battery isn’t going to suddenly start drawing 6 amps of current on the same chainsaw and it’s not going to last a couple of hours longer. We don’t live in an ideal world or in some underground laboratory. 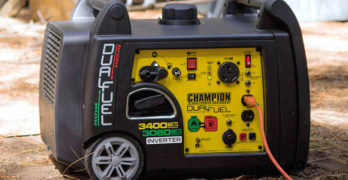 When it comes to batteries you should realize a bigger one is only likely to last longer if it’s put through its paces under the same conditions, and when talking about chainsaws it will be what they’re cutting. As you should already know by now, DEWALT are one of the leading brands in the world when it comes to power and hand tools. Workmen on building sites, garden care professionals, and normal people like you and I will all use their tools. But branching out into 40V Max cordless power tools is a big undertaking, so in doing so they’ve added a few benefits you’ll enjoy. We’re going to quickly talk about each one now before we look at which DEWALT cordless chainsaw you’ll want to add to your power tool collection. A fantastic chainsaw for homeowners. Aside from the mighty DEWALT cordless chainsaw, you’ll also find a string trimmer, a blower, a backpack blower, and a hedge trimmer in the collection. DEWALT have gone out and manufactured all of the battery-powered tools you will need at home, but they’ve come up with a way to save you lots of money. Their specially designed 40V Max battery pack will work seamlessly in each of their products, so you can buy additional products cheaper without a battery. It will also help with the next thing we’re going to talk about. DEWALT do try to market their products to professionals, but trying to temp someone to buy a cordless power tool is tough when they might use them all the time. To get around this, they’ve made it as easy as possible to switch between batteries while you’re using your cordless power tool. We’ll talk about how long the 6 Ah and 4 Ah battery will last you later on, but know you can always buy more than one battery so you never run out of power. 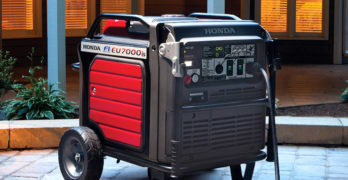 A spare battery is ideal for professionals and anyone with a decent-sized garden. You can never have too many batteries when it comes to chainsaws. I know you’ll think the 6 Ah battery is extremely powerful and it will open your eyes up to the potential of cordless power tools, but DEWALT also has a 7.5 Ah battery (DCB407). It can be used on every single one of DEWALT’s 40V Max Outdoor Power Equipment tools. If you want actual figures to back up how amazing it is, the 7.5 Ah is roughly 87 percent more efficient than its 4 Ah little brother. It has zero memory and along with the lack of self-discharge, it offers maximum productivity and as little downtime as possible. DEWALT DCB407 40V Max 7.5Ah Battery. Impressive endurance. As we mentioned earlier, the most common DEWALT cordless chainsaws come with different batteries. One of them is more powerful at 6 Ah, whereas the other is only 4 Ah. There is very little that separates each one, so we’re going to focus on the 6 Ah model. Afterwards, we’ll look at the differences in actual performance between the two using a real life example. You know how big the DEWALT brand name is in the world of power tools, so I think you’re going to be impressed by some of these special features. Solid construction and build quality means it should last for years. This chainsaw was released in the Autumn of 2015. You can read the full press release here. I’m not sure how many chainsaws you’ve used before, but it must be said it’s unlikely you’ve used anything like this. It has so many features which will benefit your life, so we’ll go through a list of the top ones you’re going to love. There is no denying gas-powered chainsaws have reigned supreme for years, because it was next to impossible for cordless models to match their performance. It all changed when DEWALT released their 40V Max cordless chainsaw, because it’s guaranteed to be as competitive as a gas-powered chainsaw. They haven’t made that claim lightly, and through vigorous testing have proven it to be true. The low kick-back 16-inch Oregon bar and chain also adds to the performance of the chainsaw, as it will be able to cut through almost anything you come up against. Can you actually believe they’ve manufactured a mean cutting machine that weighs only 20 pounds? When you compare its performance to its weight it’s a weird feeling. I know a lot of people might have been scared of chainsaws in the past, and one of the reasons is because it’s frightening to hold something so sharp when it’s really heavy. When you use a DEWALT cordless chainsaw it will feel like you’re holding a knife and cutting through butter. Its weight is certainly a massive bonus for everyone. You have to keep a chainsaw oiled up at all times, right? Failure to do so results in the chain breaking a lot quicker, general maintenance being required more often, and your cuts being anything but smooth. The 40V Max brushless 16″ chainsaw takes all the pain out of having to keep everything oiled, because its LubriLink and LubriWell features will do everything themselves automatically. You’ll still have to fill it with oil, but you’ll need to worry about it much less often and it will be easy because of the quarter-turn oil cap. LubriLink = All the small holes in the chain tie straps that will retain your oil. LubriWell = Holes in the drive links of the chain carrying the oil around the bar. We’ve looked at the correlation between weight and ease of use, but there is something else you’ll find handy. You’ll be able to play around with the tension of the chain and the tightness of the bar, which will allow you to produce the right amount of force possible when cutting. The reason why this feature stands out on the DEWALT cordless chainsaw is because it will be done using a tool-free tensioning system. It will also help you complete jobs much quicker, especially if you’re cutting through different objects one after the other. The last main feature to help you control the DEWALT 40V Max chainsaw a lot easier is the variable speed trigger you’ll be using. This is useful for everyone to use, but it’s even more beneficial to those with little experience using chainsaws. When something razor sharp is turning around at lightning speed you want to make sure you have full power over it at all times. The variable speed trigger will let you put your mind at ease, because you’ll be able to squeeze it as hard or soft as you like. One of the most dangerous things about operating a chainsaw is when it kicks back. This can happen due to a number of things going wrong, but it essentially means a tooth on the tip of the bar catches onto something it’s unable to cut through. When your chainsaw is thrown up in the air it’s hard to control, and in some cases serious accidents can occur. To prevent this from happening to you, DEWALT have built a chain brake into their chainsaws to offer kick back protection. It’s a dangerous power tool, so any important safety feature is welcomed. With gas chainsaws you need to lift weights at the gym before using them, because fighting with the pull cord isn’t a game. It’s even worse when you’re faced with the prospect of cold starts, and in some cases you can be left frustrated before you ever get to work. The DEWALT cordless chainsaw is a breath of fresh air, because with one little pull of a trigger it’s going to start straight away. If you’re going to end up fighting with the chainsaw, you want to at least wait until it’s cutting through something first. It Comes With A Fantastic Warranty! Buying any kind of power tool comes with risks, so you want to find one with a good warranty capable of protecting your investment. DEWALT are so sure their cordless chainsaw is going to last the distance, it comes with an exceptional warranty. You’ll be able to get it services for free during the first year after your purchase, and it also comes with a 3-year limited warranty. There is even a 90-day guarantee, so if you decide you don’t want it you have around 3 months to return it for a full refund. This model has the shorter lasting 4Ah battery. Good for small tasks. I did say there wasn’t a lot to separate either model, but let’s look at the basic difference first. It has a smaller battery, therefore it weighs a whopping 1.6 pounds less. To be honest, the difference is so small it’s hardly worth mentioning at all. The real difference is the performance factor, and earlier on we talked about using a real life example to help you understand what separates each battery. Before we begin, try to picture a 6×6-inch piece of pressure-treated pine wood laying out in front of you. How many cuts per charge will each DEWALT cordless chainsaw battery be able to handle? An extra battery means you get to finish all of your cutting tasks. As you can see, the bigger battery will be able to produce almost one-third as many cuts, which is quite a significant difference. We’ll now look at why those extra 30 cuts might lead you to opt for the 6 Ah battery instead of the 4 Ah one. We can answer this question easily using simple math. The 6 Ah model isn’t one-third more expensive than the 4 Ah model, so as far as the price goes it’s a far better deal. That doesn’t even take into account all those times you’ll be left frustrated because your cordless chainsaw ran out of steam before you could finish what you were doing. Even if you don’t need to cut much wood and you charge it up after you’ve used it, there are some times when you’ll forget. And because the 3-year limited warranty means you’ll own it for a very long time, the bigger battery is worth it in the long run. 22″ laser cut, hooked-tooth blade design for long reach. Powerful high output motor for cuts up to 3/4″ thick. Removable gear case cover for easy blade exchange. High impact housing for shock resistance and durability. Removable top cover for easy access to brushes. Low noise during operation – 63 dB(A). Ideal for noise sensitive regions and properties. 15″ cutting swath with 0.080″ line (also accepts 0.095″ line). Patented gear drive design that powers through overgrowth. Variable trigger with hi/lo speed control for added power or extended run-time. Is A DEWALT Cordless Chainsaw in Your Future? If you’re looking for your first chainsaw, you’ll be hard-pressed to find one as beginner-friendly as DEWALT’s 40V Max models. Even if you’re a professional the DEWALT cordless chainsaw could still be right for you, especially if you carry a spare battery or two with you. It’s actually surprising how many people have fallen in love with the power tool, as you’ll be able to see when you study all the customer reviews. I don’t think everyone would feel as comfortable using a gas-powered chainsaw, and because DEWALT has guaranteed their 40V Max battery-powered one is just as good performance-wise they’re now becoming mainstream, so you should think about getting in on the action. Learn more about these impressive DEWALT cordless power tools by visiting the DEWALT site.